Thank you Shirley. It is perfect for a card I was struggling with. 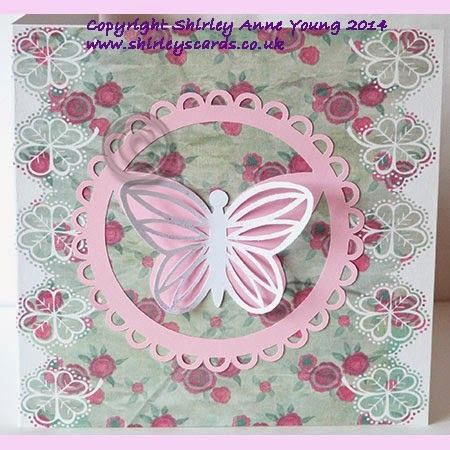 Lovely card Shirley, the butterfly topper is so pretty, and so kind of you to offer it to us all. Shirley this is so very pretty, yet again you have come up trumps, the design on the butterfly is quite different too, which makes it all the more special. Thank you!! so very much! This is just beautiful, thank you Shirley. Lovely! Particularly like how the base butterfly is attached to the scalloped circle. Thanks so much! I am so pleased I found your blog (and your freebies). I will also be purchasing some (or probably lots) of your other templates. Nice images. Thank you for the beautiful butterfly and scalloped circle. Thanks, also, for being so generous with your time and talent. Thanks for the cute file! Thank you for the lovely butterfly! So pretty! Thank you for sharing your talent with us. Thank you very much - I think I will use on a circle flip card that I am making, it will be so pretty. Another lovely card Shirley. Bonus for me as butterflies are one of my favourite things! Thank you so much for your continued generosity. I just fled this file. Thanks- I'll shout out and link to you if i use it in a blog post. Absolutely beautiful. Just found your beautiful blog and your shares. Thank you very much. Love your butterflies! Thanks so much!!! Love your butterflies, thanks so much!!! What a creative butterfly - Thanks!